I did have two small problems with the white border – I had to piece together two strips to make the white fabric long enough. In the bottom right corner… sigh… I put it on backwards, so the seam is facing up. I really, really hope to find a way to cover that up. No idea how. Any suggestions? Also, I can climb out onto the wing strut of a Cessna and jump off without a moment’s hesitation – why does working with white fabric terrify me? I’m the sort of person who will always drop spaghetti sauce on my white shirt, or drip butter on my good pants, and I’m working with vast expanses of pristine whiteness here. Thus far, and I know I’m cursing myself here, but thus far – it remains as pure as the driven snow. For now. It’s up to 61″ x 53″. Not quite feeling up to wrangling the next border on until I’d decide whether or not I have to rip the screwed up side off, I moved on. Triangles. I think I’ve discovered a problem with not pre-washing, even though it’s so nice in terms of unfussiness – the chemicals. When I iron the unwashed fabric, my eyes burn a little and I can feel my throat getting irritated. I have to wonder what forms of carcinogens I’m sucking in. That’s no good. 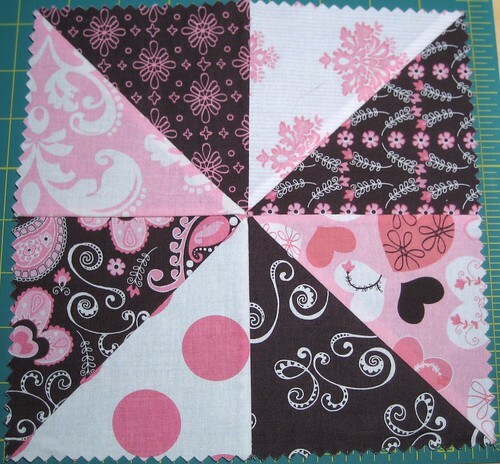 At this point, I have no idea what I’ll do with the pinwheels when they’re done – put them into a crib quilt or a doll quilt or something and give it away, perhaps. Lastly, the wretched Cliche Country blocks have been removed from the design wall and tossed into a box. It’s nice not having the unattractiveness lingering in sight – I can immerse myself in the good stuff. If I ruin it, I ruin it, and life moves on. Just rip out the lower portion of the side and resew the smaller piece so that the seam is facing the back of the quilt! This is a mistake I make frequently when working with solids! If you don’t want to rip out the seam and re-sew it I would applique something over the top of it. When I made mistakes my creativity really has to come out and I end up loving my project even more. Your pinwheels are adorable. I agree with Kare . . . just rip it far enough back to fix that one seam. Shouldn’t take that long. I’ve done that before myself — it’s an easy mistake to make. 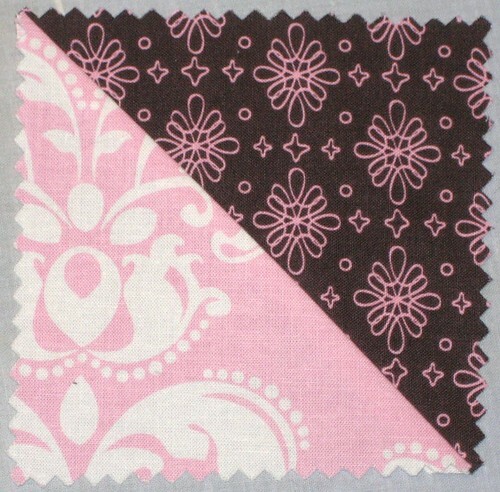 I love your pinks and browns — fabulous fabrics!!!! I like the pinwheels, too!!! Really cute! I’ve never kept a quilt that I’ve until just last Christmas when I made one for Elizabeth’s bed. It’s black and white with some hit pink thrown in for “coolness” or whatever, and it’s backed with just solid black fabric. GUESS which side of the quilt she uses? YERP, the solid black side is facing up for all to see. LMAO I could’ve saved myself a lot of trouble just sandwiching and quilting together two solid black hunks-o-fabric! Looking good – I agree with taking out the stitches and redoing it. This will not the only time to sew things on wrong. We all do it! 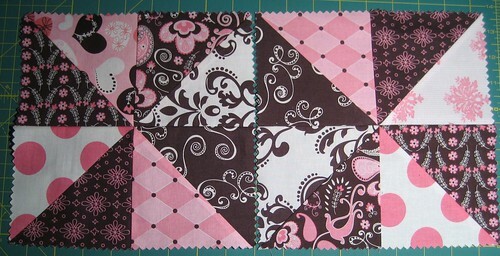 Concerning those “awful” blocks – use them to make a mini quilt and practice your quilting and binding techniques. Making a good mitered corner on binding takes a bit of practice and working on a small piece will be better. 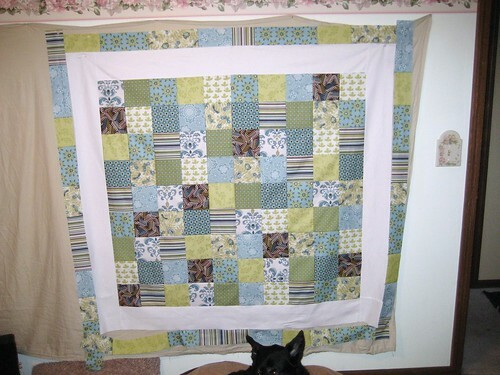 When you are ready to quilt and bind the bigger quilts, it will be easier. Great job! I love your choice of colors on both projects!